Although the little plants did look a bit snarled and cranky, by mid-day they had perked up again. But we were not going to leave them out to the cold alone for another night. 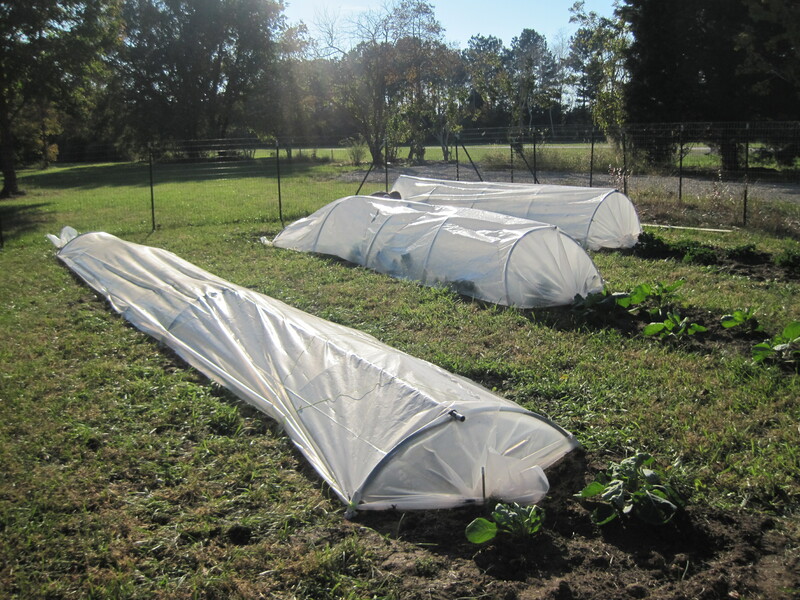 After consulting another of our gardening books, Four-Season Harvest (Eliot Coleman, Chelsea Green Publishing Co.), we decided on setting up low tunnels over some of our beds. Namely, we wanted to make sure that the salad greens had some protection and the beets & bok choy could stay warm at night. I maintain hope that our broccoli and red cabbage will produce, though it’s a bit of a long shot at this point. As is our philosophy with most of our endeavors these days — nothing ventured, nothing gained. In the book, Coleman describes a French design of low tunnel row covers (“chenille” aka caterpillar) that differ from the standard design in that the plastic covering is not trenched and buried on either side but stops just at the soil surface and then held down by stringing a lace through the hoop stakes and crisscrossing over the top of the tunnel to keep the plastic from flying off. 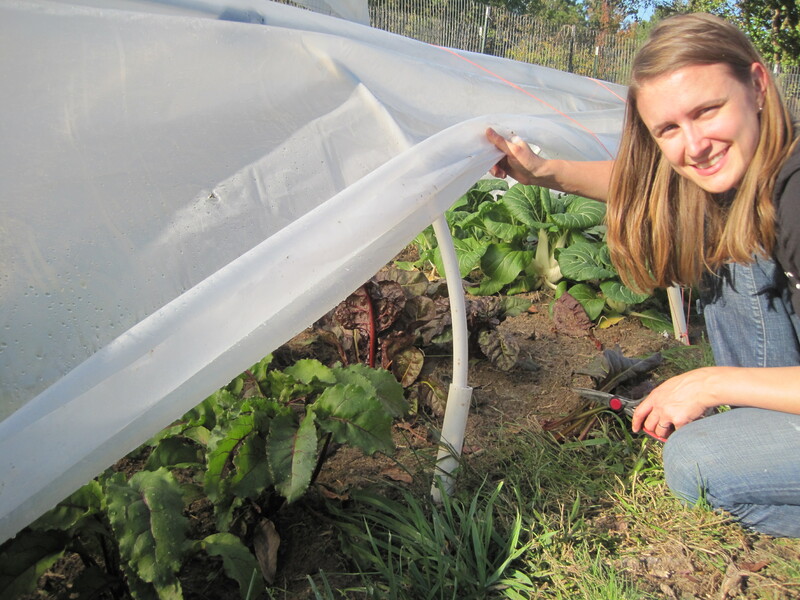 This allows for easier access to the crops and easier venting on warm days. We picked up some PVC pipes at the building supply on one of our many trips there (did I mention we’re doing construction on one of the garages? I’ll have to elaborate later). We salvaged an incredibly long length of transparent plastic from Mom & Dad G which they had wrapped around some book cases they hauled down here on their last trip (yet again, it was pouring rain that day).